My husband and I had a quick 3-day trip to London a couple of weeks ago, and I crammed in as much tea-sightseeing as possible. I had a super long list of places to visit and didn't get to hit that many. But the places I did go to were quite memorable. I had two afternoon teas, and visited two tea shops. I was going to post about my entire experience here, but it may be a bit too much reading and an overabundance of photos. 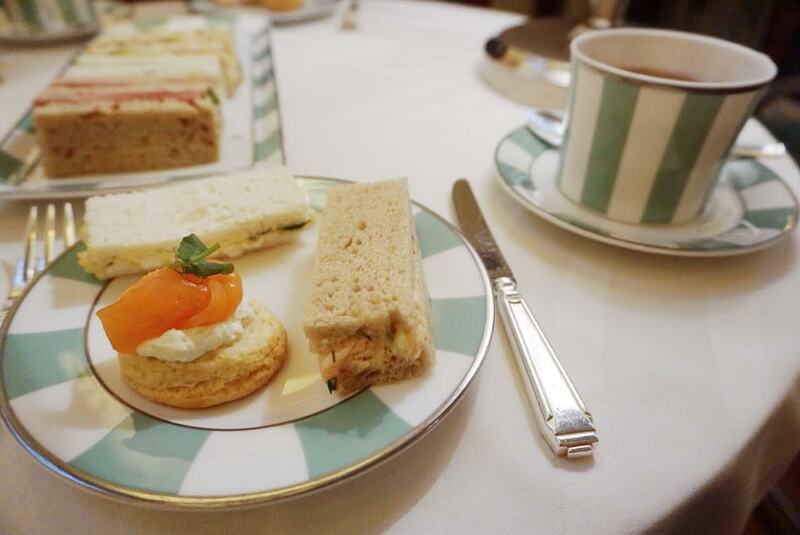 Today's post is about our first afternoon tea adventure. 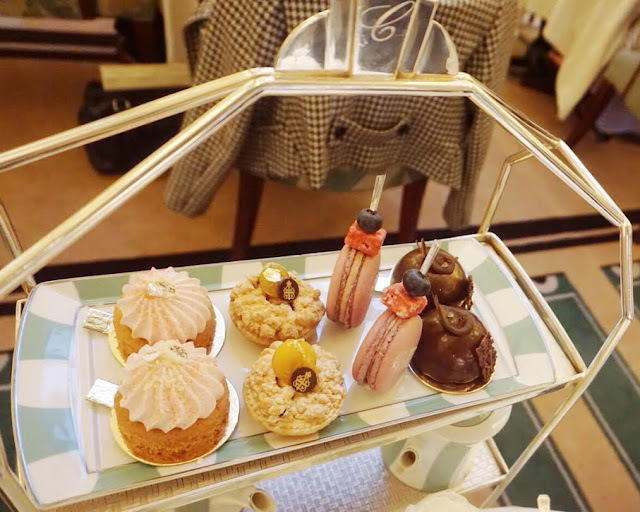 I've had many afternoon tea experiences in NYC (I am trying to write a large post on all of those, it's taking some time! ), so I wanted to do two different types while in London- one very traditional, and one more unique. After asking every London tea blogger I know, I decided to visit Claridge's (very traditional) and Sketch (unique is a bit of an understatement for this place!). I hadn't been to London in years, and forgot how every street has something interesting to look at. History swirls in the air, and you can't walk more than a few steps without seeing something fascinating. Some may say this about NYC, but London beats it by lightyears. 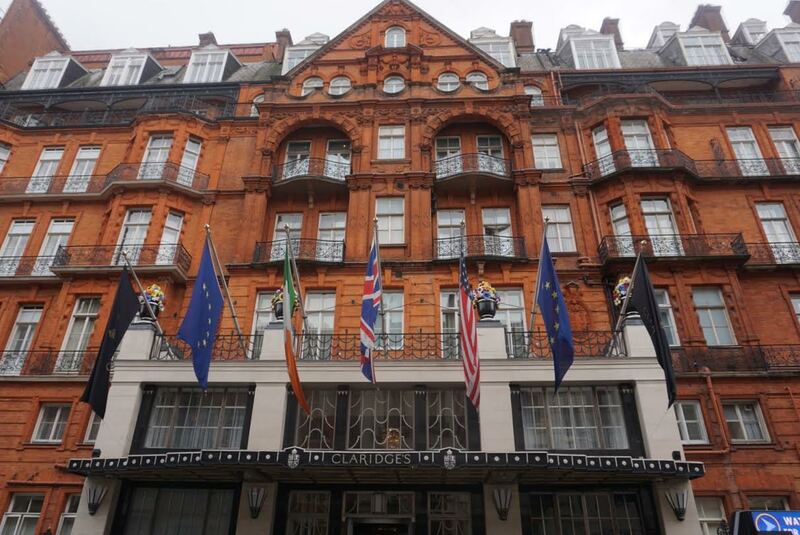 We stayed in the Mayfair neighborhood which itself is quite lavish, but we still felt very posh walking up to Claridge's hotel. It's a historic building with perfectly manicured flowers. Inside the decor is dripping with art deco flourishes, and tea is taken in a dining room fit for Ladies and Lords. 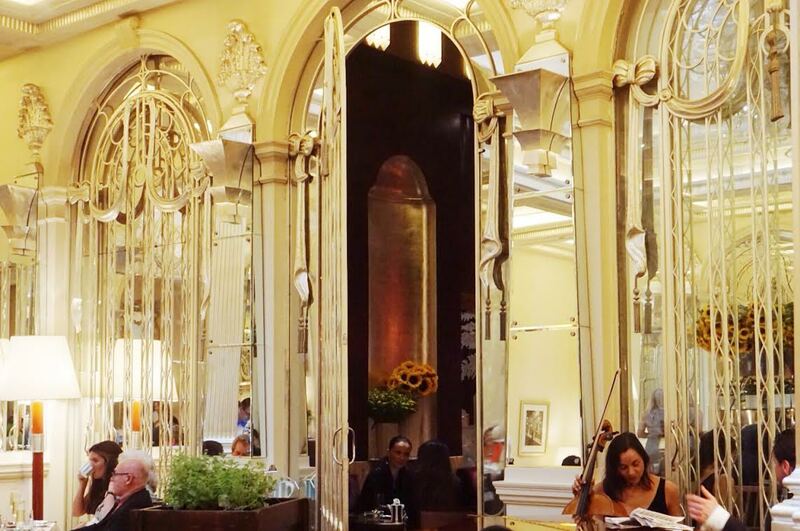 Live music greets your ears while your eyes soak up the grand decor. All of the tableware is designed with their iconic stripes. It may sound dull but it's deco at it's simplest and most beautiful, especially within the extravagant room. I was expecting stoic, stuffy service, but I was pleasantly surprised. Our server was of course formal, but cheerful and even a little bit friendly. It was just the right combination for the surroundings and the tourist-heavy crowd. Selecting the tea was the hardest part of the day. 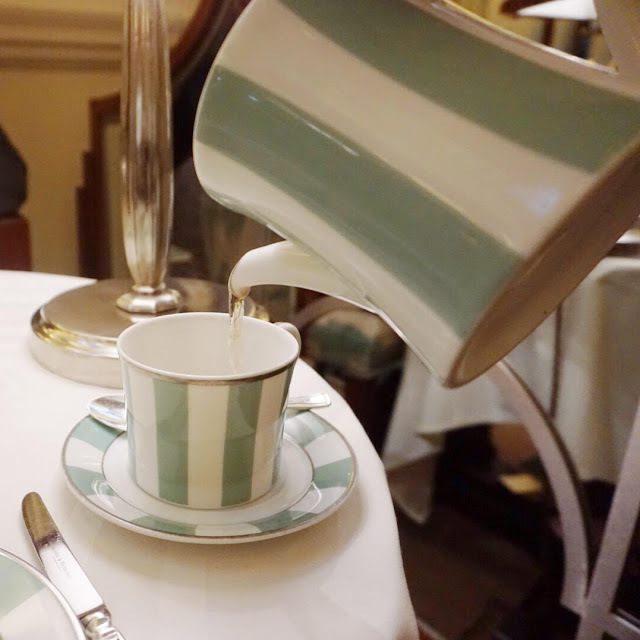 Claridge's has an extensive tea menu, and I couldn't decide what to choose. Some of you may know I lean towards black teas for afternoon tea because the straightforward brisk flavors pair well with both sweet and savory. I finally settled on a blend that was made just for them. 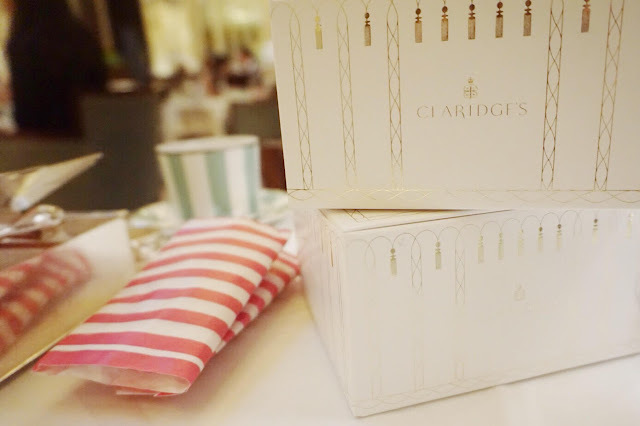 The Claridge's blend is, "a bespoke blend created exclusively for Afternoon Tea at Claridge's. The blend has a unique depth of flavour that combines the power of an English Breakfast Tea with a satisfying complexity. The flavour is rich and aromatic with a deep, malty finish. Perfect served without milk, partnered by a fresh warm scone." This menu description is quite accurate. I was happy to see they didn't recommend milk for this blend, as I usually don't add any to most of the black teas I drink. We began with the tea, and I was amazed by the very small teapots. 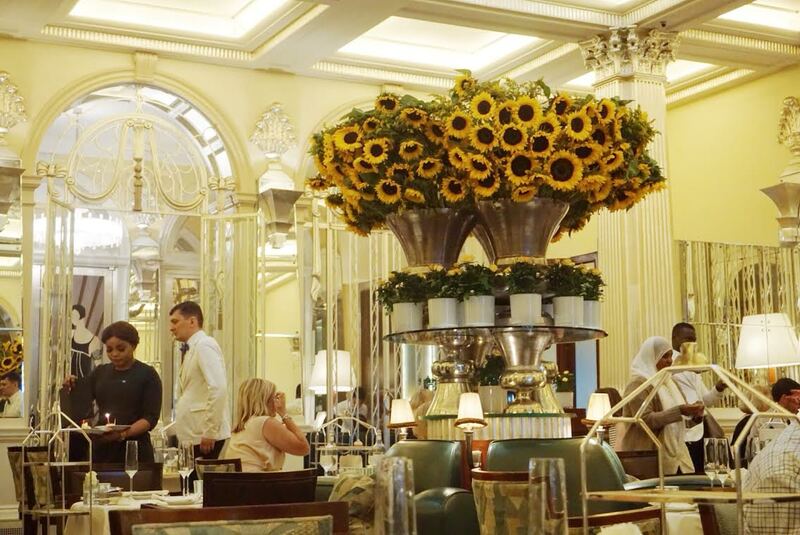 Shouldn't such an opulent place present enormous pots of tea? I was also surprised to watch the server prepare the tea. He added the hot water from a larger pot, waited about 30-60 seconds, and then poured. When I asked about this method he replied that it is the process they use at Claridges so the tea does not sit in the pot and get bitter or cold. You are given a fresh cup of tea as soon as your last has been finished. This led to very attentive service, and remarkably delicious tea. The tea was perfectly steeped, which surprised me given how quickly it was prepared. It reminded me of a gongfu preparation where a larger amount of leaf is used for a smaller yield. I had quite a few cups steeped with the same leaves, and it held flavor and strength throughout. Once the first few sips of tea were enjoyed, our savories were whisked over to the table. The choices were very traditional, but with an extra dose of luxury. The smoked salmon was fresh flaky fish, not the preserved stuff you often see. I'm not usually a huge fan of fresh salmon, but I finished every flake-it was flavorful and delicate. The ham sandwich was one of the most savory examples I've had. The egg salad consisted of duck eggs carefully and gently prepared. Everything was full of flavor and freshness. The scones came next, and were flaky and light. I couldn't get enough of their house-made jam, or the clotted cream. Delicious. Needless to say we were absolutely stuffed by the time the sweets arrived. The few bites I had were very nice, but nothing unique or particularly outstanding. Still good though. We had to box up most of them, and enjoyed them a bit the next day. As in many fine dining establishments, we were given a package of sweets to take home with us. I find this is always a nice way to end a meal and remember it for days to come. Afternoon tea here is not a cheap affair. But it is an afternoon steeped in historic luxury. It feels like a special occasion, and I'm thrilled to have experienced it. I like that the servers are so attentive with the tea making. That's rare, even in the fancier establishments.